The Manual Transmission – on the Road to Extinction? 1970 Plymouth Superbird – a Rotten Egg or Golden Egg? The Mustang GT which came back from the dead in 1982, put Ford back in the performance game after a long hiatus. Per dollar it was the best street brawler money could buy during the 1980s. The Mustang GT received mild updates and continued to use the same Mustang platform and general overall design which was first introduced for the 1979 model year, until the 1993 model year. The platform was the rear-wheel drive Ford Fox body. It was a cost savings measure, many Ford, Mercury, and Lincoln products used the Fox body platform during the 1980s. By the early-1990s the Mustang was the only car still built on this platform. A lot had changed in the auto industry during the 15 years the Fox body was the Mustang’s platform. Ford never planned this long run, the Mustang was originally slated to move to a new front-wheel drive platform by the late-1980s. If it had not been for the vigilance of Mustang fans sending letters and making calls to Dearborn, along with continuing to buy Fox body Mustangs during the 1980s, this would have happened. Ford eventually got the picture and began work on a rear-wheel drive Mustang replacement code-named SN95. Ford spent $700 million on the development of the SN95. This amount of money back then was peanuts for the development of a new car, but Mustang engineers made the best of the situation. They updated the Fox platform, this was a wise move since the Fox platform’s weight was very light compared to similar platforms offered by competitors. Its light weight combined with a potent 5.0 liter V8 was why the Mustang GT during the 1980s packed such an effective performance punch. 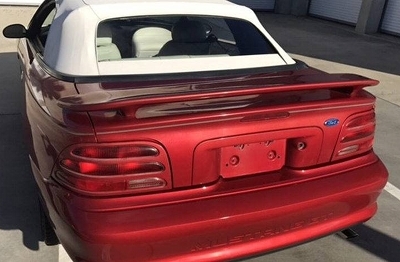 The end result of SN95 development was the 1994 Mustang. It was quieter, rode better, had improved handling, and was better in all areas in comparison to its predecessor. 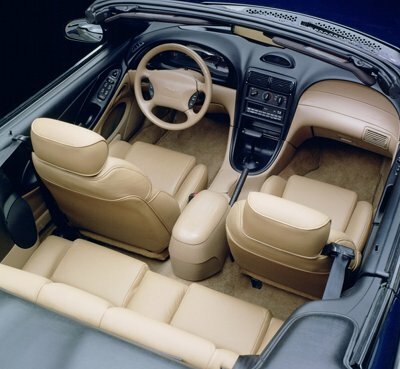 With an all new exterior and interior, the 1994 Mustang brought the Mustang firmly into the 1990s. The exterior and interior were both ultra modern yet there were a few styling touches that harkened back to the first generation Mustang. The most obvious were the dual horizontal creased lines along the doors and the dual bump interior dashboard design. The interior now had a very modern yet attractive look. The dash layout no longer looked thrown together, it was artistic and had the feel of a much more expensive European sports car. The seats were very comfortable and provided great support. Though the GT now had a lower more sleeker look it didn’t lose the almost perfect higher front seating position of its predecessor when compared to its competition, that allowed great visibility out the front windshield and side glass windows. The boxy styling of the previous Fox Mustang was gone, the curvy sleek lines of the 1994 Mustang were a welcome departure for Mustang fans. Production of the 1994 Mustang GT nearly doubled from 1993’s 26,101 units to 62,719 units. 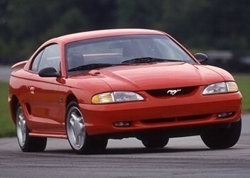 The 1994 Mustang GT covered all the bases by offering both 2-door coupe and 2-door convertible versions. The weak areas of the previous Mustang GT were now fixed. The 4-lug wheels were now replaced with proper 5-lug wheels and the harsh ride was replaced with a more civilized ride with improved handling manners. Additionally the GT finally got standard 4-wheel disc brakes. Handling and steering feel were greatly improved. In fact the 1994 Mustang GT was such a great overall package, it was Motor Trend’s 1994 Car of the Year. Th e GT was standard with 16-inch wheels and 17-inch wheels were optional. Due to the SN95’s limited development budget, new engine development was passed over for the 1994 Mustang GT. The 302 cubic inch 5.0 liter V8 which had a been a Mustang engine option since 1968, would continue in High Output form in the GT for 1994. This was both good news and bad news. Though the 5.0 liter HO V8’s engine power output increased from 205 to 215 horsepower and torque increased from 275 to 285 lb-ft of torque for the 1994 Mustang GT, this was still a net power loss since horsepower and torque had dropped for the 1993 Mustang GT. The 1987-1992 Mustang GT was rated at 225 horsepower and 300 lb-ft of torque. A 5-speed manual transmission was standard and a 4-speed automatic was optional with the 1994 GT. Though the 1994 Mustang GT was still very light with a curb weight of around 3,200 lbs, this could not make-up for the horsepower deficit it had when compared to its arch rival the 1994 Chevrolet Camaro Z28. The Z28 may have had a curb weight of 200 lbs more, but it was cranking out 275 horsepower and 325 lb-ft of torque. The 1994 GT went 0-60 mph in 6.6 seconds and the quarter mile in 14.9 seconds. Which for 1994 was pretty impressive. However these figures are nearly identical to what a mid-1980s Mustang GT was capable of. Additionally the 1994 Z28 obtained a 0-60 mph time of 5.6 seconds and a quarter mile time of 14 seconds flat. None of this really mattered, the 1994 Camaro Z28 even with its great peformance advantage sold in lower numbers compared to the GT. Only 40,940 Z28s were produced for 1994. Ford starting in 1993 relegated the lower production and much more pricey Mustang SVT Cobra to do battle with the Z28. It wouldn’t be until the 1996 model year that he SVT Cobra matched the Z28’s performance. The GT would never match the Z28 performance again, it would instead be a performance car that would provide a perfect balance of handling, power, comfort, and styling. Customers loved the GT package, it has sold consistently well over the last three decades. Ironically it wasn’t until the revival of the 5.0 liter V8 which was a Dual Overhead Cam motor this time, for the 2011 model year that finally returned the GT to being highly competitive with its high horsepower competition. 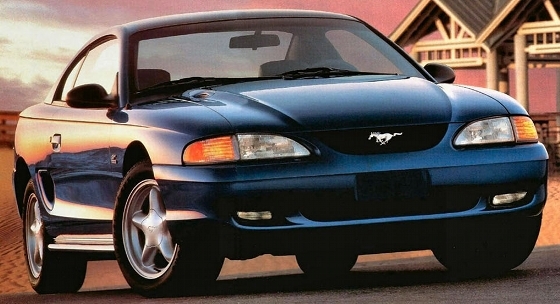 The 1995 Mustang GT was a virtual carryover from 1994, with very strong sales Ford had no incentive to make any changes. Production slightly increased for 1995 to 63,756 units. What makes 1995 so significant is that it’s the last year for the old Windsor based pushrod small block 5.0 liter V8. It wasn’t important at the time since Mustang GT fans were tantalized by the introduction of the Single Overhead Cam (SOHC) 4.6 liter V8 in the 1996 Mustang GT. It was 10 percent more fuel efficient and produced the same 215 horsepower and 285 lb-ft of torque of the 1994-1995 5.0 liter V8. By 1998 it was up to 225 horsepower and then in 1999, the 4.6 liter V8’s horsepower was up to 260. If you are looking for an inexpensive future collectable muscle car a 1994 or 1995 Mustang GT is a very smart choice. It will surely not disappoint. It has all the stuff that makes for a fun car to drive, not to mention it’s got that traditional V8 growl emminating from it’s true dual exhaust system that sounds as good as the best of the muscle cars from the golden era. With all that the 1994-1995 Mustang GT has going for it, one thing’s for sure its current low purchase price won’t stay low for long.